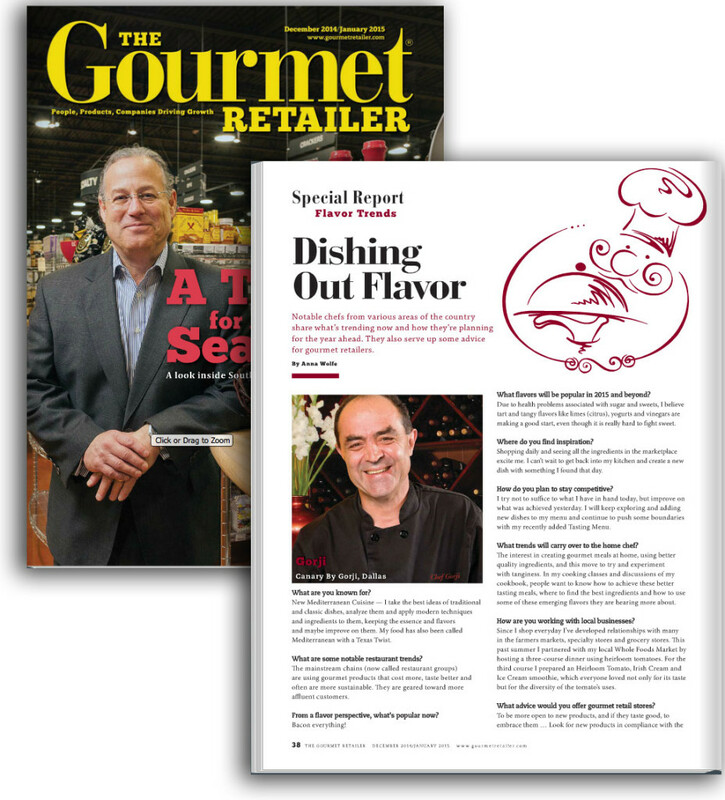 Chef Gorji talks flavor trends 2015 in Q&A with Gourmet Retailer Magazine. The December/January issue of Gourmet Retailer magazine, presents a Q&A with Chef Gorji and other chefs from around the country about what flavor trends they are seeing for 2015.
Notable chefs from various areas of the country share what’s trending now and how they’re planning for the year ahead. They also serve up some advice for gourmet retailers. Chef Gorji says he is seeing an increased interest in tart and tangy flavors at his upscale restaurant, Canary By Gorji and in questions from people about recipes using his Gorji Gourmet Foods® product line. In fact, he has launched a new sauce with heat and tang. The new addition to Gorji Gourmet Foods is Arrabiata Diavolo, and it is devilishly tasty! Some excerpts from the Q&A. What flavors will be popular in 2015 and beyond? Due to health problems associated with sugar and sweets, I believe tart and tangy flavors like limes (citrus), yogurts and vinegars are making a good start, even though it is really hard to fight sweet. What trends will carry over to the home chef? The interest in creating gourmet meals at home, using better quality ingredients, and this move to try and experiment with tanginess. In my cooking classes and discussions of my cookbook, people want to know how to achieve these better tasting meals, where to find the best ingredients and how to use some of these emerging flavors they are hearing more about. What advice would you offer gourmet retail stores? To be more open to new products, and if they taste good, to embrace them … Look for new products in compliance with the new thoughts as well as the old. In my own demos, I revel in joy when I see how young children and teenagers are taking to these modern, cleaner, less sugary tastes. No Replies to "Talking Flavor Trends With Gourmet Retailer Magazine"